L.A. Noire’s remaster brings the cult detective story back for another round of sleuthing. A change to the dialog system meant to fix the original game’s flaws makes interrogations more difficult than before. In L.A. Noire, Detective Cole Phelps investigates various crimes before getting swept up in a city-wide conspiracy. A major component of the game is interrogations. During cases, Cole can question witness and suspects, and players are meant to figure out if they are telling the truth thanks to advanced facial animation technology. In the original, you had three options for any statement. If you believed the subject, you could select “truth.” If you thought something was fishy, you could choose “doubt.” If you had evidence proving them wrong, you could select “lie.” These options were originally called Coax, Force, Lie before changing in development. A major complaint about this system was how confusing it is, particularly the doubt option. Cole’s reaction when “doubt” was selected were often angry accusations and threats. 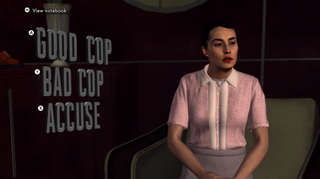 To solve the difficulty in judging Cole’s tone, the remaster has renamed the three option to “Good Cop,” “Bad Cop,” and “Accuse.” The aim is to provide clarity about how Cole will act. Cole’s behavior is still difficult to manage even within the new dialog system. Much of this has to do with the vagueness of what it means to “good cop” or “bad cop” someone. These terms encompass a wide range of possible actions. I might good cop someone by believing their story, but it could just as easily be said that I “good cop” simply through a congenial attitude. This also applies to bad cop. Am I threatening to arrest someone? Am I making a threat of physical violence? Am I just being grumpy? Hard to say. While the original system of “Truth, Doubt, Lie” often failed to inform the player of how Cole would behave, it did let them know what action he’d accomplish. The doubt option fell pray to Cole’s mercurial dialog swings, but at least I know what it means to doubt someone. Having just played through L.A. Noire recently on Kotaku’s Twitch channel, I can say that I found it much easier to guide Phelps in the original dialog system. Even if “doubt” sometimes has Cole yelling his head off, I know which way the conversation will flow from a gameplay perspective. If abbreviated options needed to remain for the remaster, selecting stronger verbs could have made a difference. “Believe, Doubt, Accuse” strikes me as a suitable alternative; they are all understandable verbs that communicate what the player will actually be doing. An even better change would have been to remove ambiguity entirely, allowing players to hover over a selection to see exactly what Cole will say next. L.A. Noire is a genuine classic, even if it gets a little weird. Proper detective stories are a rare thing in video games, and while the original dialog system sometimes had Cole act like a jerk, the replacement turns interrogations into a genuine guessing game. "You Can't Prove That I Didn't Write These!"